$3 signature TACOS is what we’re TACO’n about! Choose from the Steakum Taco, The Woody Taco, The Turkey Taco, The Archie Taco and Bub’s Fish Taco. 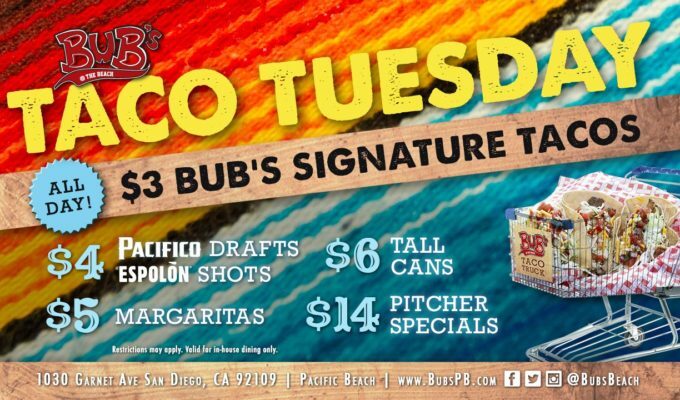 Wash it down with $4 Espolòn Shots, $4 Pacifico Drafts, $5 Margaritas, $6 Tall Cans and $14 Pitcher Specials ALL DAY!